Let me begin by saying that I feel like a freakin’ genius. I’m not kidding. I’m usually such a humble and chagrined person with very little moments I would call prideful, so this is really unusual–seriously unusual. But, regardless, today–I’m so full of pride I’m popping with it. My lovelies, I made a Gluten-Free & Vegan Lemon Meringue Pie. No kidding. No joking. And no messing around. This is like the holy-grail of awesome desserts in my family and I just made it so that my kids and husband could eat it. I. Am. Genius. That is all. What really has me sitting on top of the world is that, first, I have never attempted to make a Gluten-Free & Vegan Lemon Meringue Pie before, so I thought it would take a few shots before I got it right. Wrong. I was wrong. It worked the first time without anything to be sad about. Second, I have never made a lemon meringue pie before–nope, not once. And so, yet again, the fact that it came out right…well, I’m astounded by my own awesomeness today. Third, it was easy. And finally, it was so yummy…so very yummy…we scarfed it down in less than a day. Just for the day though. Don’t worry–I will stumble on the next recipe or just trip on the stairs even and I’ll feel like my normal, nerdy self in no time. Heh. The only think I would do differently with this recipe if I made it again tomorrow? I’d put some yellow food coloring into the filling. I mean, I know that the eggs are what turns it yellow and even homemade lemon meringue pie is not necessarily yellow like what you see in pictures or at restaurants, but I’d still do it. For the blog. And because I like pretty-colored food. Seriously–I think my mom let me watch too much Rainbow Bright as a little kid. Heh. 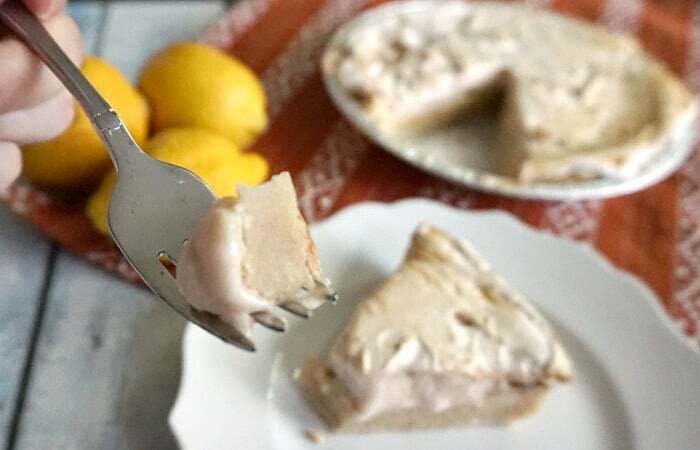 So, you can add yellow food coloring, but the recipe doesn’t require it and if you just want a soft, pretty beige Gluten-Free & Vegan Lemon Meringue Pie, you can totally just make it exactly like I have it written here and your pie will turn out exactly like the photos. Genius. I tell ya. LOL! I made a Gluten-Free & Vegan Lemon Meringue Pie. No kidding. No joking. And no messing around. This is like the holy-grail of awesome. Just use my pie crust recipe here. 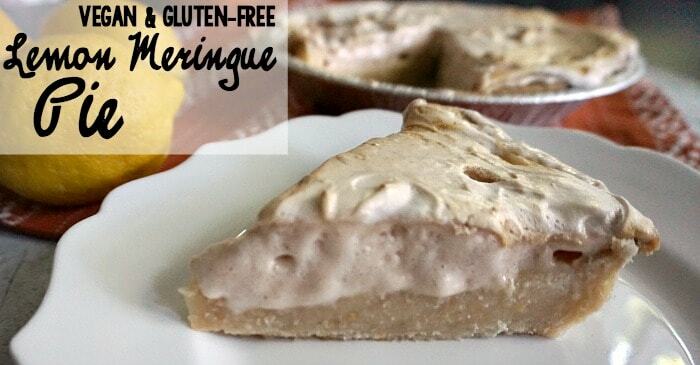 Or your favorite vegan & gluten free pie crust from the frozen section. Whatever. Place the bean juice into a small sauce pan over medium-high heat. Stirring frequently, allow the bean juice to reduce for 15 to 20 minutes. Remove from heat and place in the refrigerator while you do everything else. Place pie crust into the oven and bake for 10 to 12 minutes. Combine the dry ingredients into the wet in 1/3 increments. 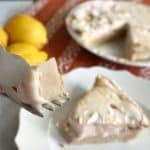 In the last 15 minutes before you plan to remove the pie from the oven, make the meringue by combining the sugar, vanilla and refrigerated reduced bean juice in your stand mixer and turning it on high. In about 10 minutes your meringue should be starting to enter the stiff peak stage. Keep going a few more minutes until it's DEFINITELY in the stiff peak stage. Being very careful, remove the pie from the oven and spoon the meringue on top. Place back in the oven for 15 minutes. Remove and immediately place in the refrigerator for a minimum of 2 hours. Serve to your drooling fans! 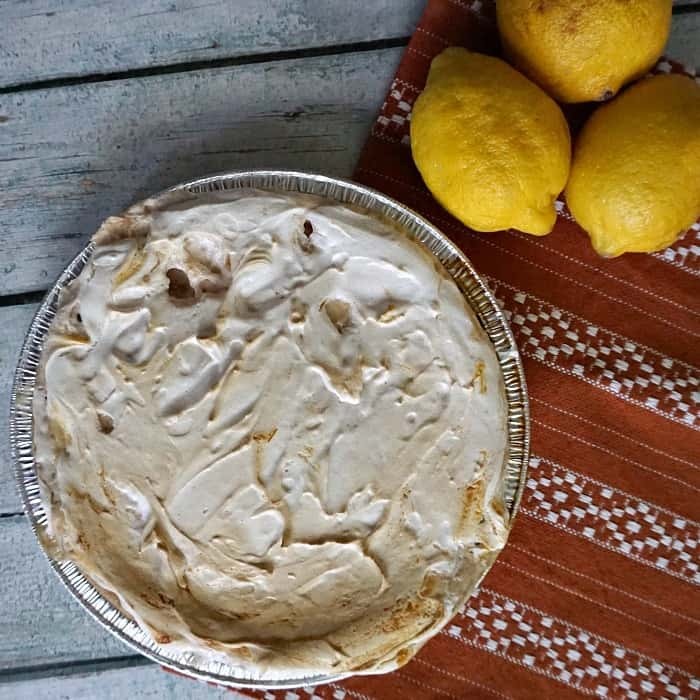 I’m dying for you to taste this Gluten-Free & Vegan Lemon Meringue Pie recipe and let me know if you, too, think I am genius. Just drop me a line in the comments below or find me on Facebook. Honestly–is it good?